Congratulations to "Rebe" our Grand Prize winner, and "Alyssa" and "Marijane" our runners-up. Thank you to all who participated, and Happy St. Patrick's Day to all! From March 15 -17 everyone has an opportunity to experience the LUCK OF THE IRISH on JUST ROMANTIC SUSPENSE! Thirty of your favorite Romantic Suspense authors have pitched in with their printed books to make your St. Patrick's Day a special one. On March 17th, one grand prize winner will be able to select 10 titles of their choice from the Pot Of Gold. To enter, simply leave a comment and tell us how lucky you are...or aspire to be! Revision - You will note, there is a bonus 31st book in the pot. This means our grand prize winner gets to select 11 books of their choice!! Giveaway ends 11:59pm EST March 17th. Please supply your email in the post. You may use spaces or full text for security. (ex. 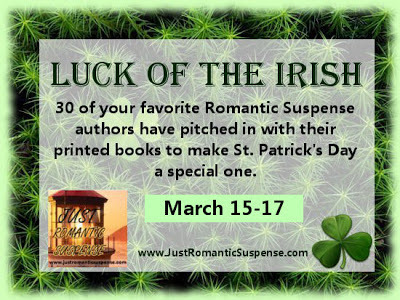 jsmith at gmail dot com) If you do not wish to supply your email, or have trouble posting, use the email maureen@justromanticsuspense.com with a subject title of JRS LUCK OF THE IRISH GIVEAWAY. This giveaway applies to US and CANADA mailing addresses only. It's always a nice surprise to have luck when you least expect it. Enjoy the weekend and Happy St. Patrick's Day. I am lucky that my eye disease has not progressed in the last 6 months. Experimental shots (yes a shot directly into the eye) seems to be working. While my eyesight will never improve I still have the ability to read and that is a wonderful gift. Plus, I am extremely lucky in having a wonderfully supportive family. I am a lucky girl in so many aspects of my life! Now, in winning one of these JRS mega-giveaways? Not so lucky. I hope to change that this time. I mean, I am part Irish if you go way back in my family on my mom's side. Hope everyone has a wonderful weekend and St. Patrick's Day! I've read and reviewed some of these books and they were great! Would love to read the others. You have outdone yourself in choosing excellent authors to share with us. I'm half Irish and my luck comes and goes with the season. But I have been greatly blessed (Irish blessings?) with family, friends, and the gift of enjoying the small things in life. Thanks for the thrill of maybe being a winner...smile. I've no Irish in me whatsoever (a rarity in my current city! ), but I just finished the draft of a chapter for my doctoral dissertation and sent it off to my advisor for feedback, so I'm feeling pretty darn lucky :). And it means I have the weekend off to enjoy the festivities. I am lucky in so many ways....I have a great husband, beautiful children, wonderful friends, and a very happy life. I'm lucky to have some of that Irish blood running through me. Hopefully this post will be my lucky charm and I can win some great reads! Wow...JustRomanticSuspense, this is a great line-up. Many of these authors have new books out too. I feel lucky, and I find that opportunity comes often. Please count me in. I feel lucky! My family and friends are my luck. Lucky... I have a lovely shamrock charm I feel is lucky, LOL. Wishing everyone a very Happy & Lucky St. Patrick's Day!!! I am very blessed and lucky to have such a wonderful family. I hope to be lucky at winning a few good books too! I am lucky that I have a beautiful, healthy little boy! My family is awesome and I am very blessed. Thanks for the giveaway! I am lucky to still have both my parents. I am lucky to have made friends with so many wonderful people. I consider myself lucky to wake up on this side of the dirt every day. I am lucky that my family is entirely happy and healthy. 3 children graduating and 1 getting married all in June may kill me, but for now all is well. The last year or so has not been particularly lucky for me but I have faith that my luck will turn around soon. I have two parents that are putting in good words for me in Heaven. They never let me down. What an amazing line-up! There are some things I have a bit of luck with and others not so much. I'd like to switch that around and be lucky at some of the things I haven't been for a change. The one thing I hope doesn't change is how lucky I am with the friends that I have. Wow, what a great list of books! I have been lucky enough to win a few things in my life but I am just lucky to have a great family and food friends! Reading is my "me" time so any books are appreciated. Thanks for the chance to win! I was lucky to marry my husband on St. Patrick's Day. We will be celebrating our 23rd anniversary this year. What a wonderful giveaway! Thanks for the opportunity to win. I guess my luck is okay!! I'll know in a few weeks if I got the new job I applied for! thanks for the awesome giveaway, lots of my favorite authors listed here. My friends and adopted family got a a very rude awakening to the fact that life is too short and very precious, in the form of a stage 4 cancer diagnosis of an otherwise very healthy and very young man. I count myself lucky to have grown up with this man and seeing him become the awesome person he is today. We are going to make the most of the time we have and to make that time count. What a fantastic giveaway! Thank you!! Thanks so much for a great giveaway! I have many blessings in life but the one at the top of my list is my husband, a man I've been in love with since high school. I'm truly blessed with him in my life. Thanks for such a great giveaway. I am lucky/blessed to have such a wonderful family. Even though we get on each other's nerves sometimes in the end we always stick together. What a wonderful giveaway, thank you to the very generous authors. Luck is taking an opportunity, grabbing the reins, and driving to your destination. I'm lucky to have a real friend who I can call on whenever I need help even though we don't see each other as much as we would like. I am lucky this month. I won an all expenses paid trip to Las Vegas to see Bon Jovi in concert.I won it through Avon. My trip is next weekend. I would love to win theses too. Good Luck to everybody. Possibly the least lucky person you have ever met. Ah well. Actually, unless this contest changes things, I have to confess, I'm about as unlucky as can be. I could enter a contest with a 50/50 chance and still lose! So I guess I have to aspire to be lucky. I do have some Irish ancestry so if I call on the luck of the Irish, perhaps they'll come through for me! Begorra! I am lucky to have found the love of my life for the past 11 years and the joy of my daughter, the best surprise I never knew I wanted until I got her. I don't really need luck to be happy just lucky to be loved. I'm lucky but mostly blessed to have a hardworking husband,not so irritating tweens and a stable desk job that helps with gas and groceries. God bless 'Merica! I am lucky for having a great hubby,6 children and eight grandkids. Although they are in ill health, I am so lucky that my parents are still living and happy. I am lucky to have three wonderful boys and loving husband. We are all healthy. Ann M. - - apmkc1 at gmail dot com. I'm never lucky enough to win anything. I am so lucky I've gotten to read many novels by Pamela Clare and Cindy Gerard! They're awesome authors. I'm Lucky because I hav wondeful family and friends that would do anthin for me. Thanks so much for the chance to win some AMAZING books!! I'm so incredibly blessed--that's even better than luck ;) Thanks for such a fun celebration of the good things in our lives! I'm lucky that I can read. Therefore I'm never bored. I'm lucky to have a soft couch to read upon and soft, sweet dogs to share it with me! I just lost my biggest cleaning account. I am taking that as a blessing!!! Been working too much, need to slow down and enjoy life!! Very lucky I am. llsalas at juno dot com. I'm lucky that my Mom was able to pull through from critical care to coming home after three months in the hospital. I have never realized that my sisters and I are lucky that Mom is still alive. Well here goes..hope I have some good luck...If there wasn't bad luck I wouldn't have any luck at all. Costs keep going up but my husband's pay doesn't....if the post office does away with Saturday delivery he will be taking a huge pay cut......Good luck to all who enter and Have a great day too! I have not been lucky in love, but. Am lucky tat aim blessed with a great family and friends. Work is going well and. Did get a bonus this month! So am feeling lucky and hope it continues. My luck goes up and down so hopefully it will be good today. I am lucky to be surrounded by wonderful family and friends. I'm lucky to have 4 healthy kids, a loving husband, healthy parents and siblings, a big, close family and a comfortable life. i haven't had very good luck as of late, but i'm hoping it turns around soon. I won a few contests for free books last year though so that was pretty cool. i'd like that to continue for sure! thanks for the chance to win. I've been really lucky this spring - I'm training for a half marathon and so far I've been able to make all of the long runs, which I did NOT expect to happen.